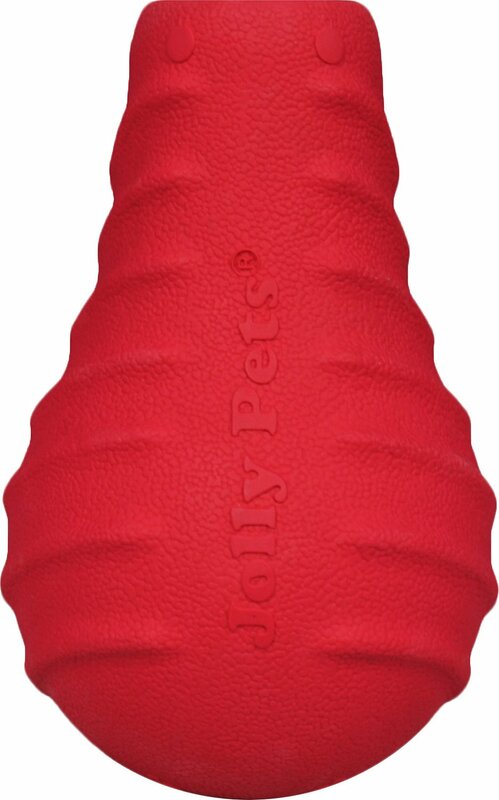 The Jolly Pets Tuff Dog Toy challenges your dog with a unique design that makes him work for his treats. Choose from the Jolly Tuff Teeter that’s made to rock back and forth or the Toppler that features a weighted bottom for intense toppling action. These durable chew toys are made from a specially formulated “tuff” blend of thick natural rubber to stand up even to the most determined treat-seeking pups. Tuck a tasty snack inside for a special hidden reward. Interactive toys are made from all natural, thick rubber and are sure to be a hit with your furry friend. Raised surfaces help clean your dog’s teeth as he chews, aiding in oral health and maintenance. Stuff with treats, peanut butter, yogurt, or any homemade snack to keep your pup interested and stimulated. Teeters or topples for maximum fun and is great for fetching and providing your dog with plenty of exercise. Top-rack dishwasher safe so clean up is a breeze! Stuff with treats, peanut butter, yogurt, or any homemade snack to keep your pup interested and stimulated. Goes right into the dishwasher - just pop it on the top shelf. My 55 lb pitbull destroyed this in less than 10 minutes unlike the Jolly Pets balls and tire. I do not recommend these for major chewers because the shape of them is not as durable. That said, get the balls without handles (easily eaten). They may chew the rope on the other kind, but the ball will last. Too soft. Not for "chewers"
Bought to put treats in, our treats fall out to quickly, someones review said it was made in the US, it is NOT, it's made in Vietnam. May work if you had larger treats, seems durable enough, my dog doesn't want to play with it. This toy is so fun to put food or treats into and let your dog chase it around the room! Our girl is an intense chewer and it lasted quite a while (about a month) before she started to get chunks out of the open end. For reference, she's a young 35lb. pit mix. I get this for my dog at the Tomato Festival in Nashville from Crossroads Campus yesterday and my dog loves it. Only had it for day. The first day I gave it to my dog he loved it and would not put it down. I hope it can stand up to it's name. If so I will buy more. I bought this toy for my dog, because it said it was for strong chewers, and I've bought this brand before...never this particular toy. Within 5 minutes, it was in pieces. Such a disappointment. Not worth the money. I got this for my puppy as an intro food puzzle and it almost doesn't last her longer than if I scattered food on the floor myself. It doesn't stand itself back up after being toppled over so they just push it a bit and everything falls out of the too-large hole. My dog has teeth issues and I had purchased other Jolly toys. Within minuts the top was chewed off. It didn't work for my dog, however the Jolly bones work great.